To complement its public programs which engage the general public in Budapest, in 2016 Blinken OSA launched a special Education Outreach Program to connect with and involve K-12 level teacher and student communities in Hungary. In 2016-2017 a total of 11 education outreach projects involved: 2652 students, 190 teachers in 161 high schools and universities from 44 towns and cities across Hungary. On the 60th anniversary of the Hungarian Revolution of 1956, Blinken OSA launched a series of public events including two creative competition calls for students and teachers. The call - launched in partnership with Prezi - invited youths under 20 to present the story of the 1956 Revolution via innovative visualization solutions and/or by developing special software applications using Blinken OSA’a special 1956 digital collections. A professional jury made up of leading Hungarian technology professionals reviewed the applications and awarded the best student works. The call invited high school teachers across Hungary to present the events of 1956, its consequences, as well as the lessons learned using primary sources from Blinken OSA’a special digital collections which contains unique original footage, photos, audio recordings and textual documents related to the events. This competition accepted ideas for original and creative scripts for commemorative events in schools, or installations to be displayed in schools. A professional jury comprised of historians reviewed the applications and awarded the best works. On the occasion of the 30th anniversary of the nuclear disaster at Chernobyl, this creative workshop invited high school students to revisit the events via archival sources, and examine its global echoes, media coverage, and implications today. The workshop also encouraged dialog about alternative energy resources through creative games like modeling a school operating fully on alternative energy resources. During the 3 days of the program, 216 students from 8 high schools in Budapest and surrounding towns joined the workshop. In conjunction with Poverty Revisited, a conference organized to revisit the work and heritage of renowned Hungarian sociologist István Kemény, Blinken OSA organized workshops for high school students to explore issues of poverty, exclusion and solidarity. into the complexities and challenges of living in the streets. The students had the opportunity to experience everyday challenges of the homeless via interactive games. The goal of the project was to learn about the complex societal dimensions of homelessness, and explore concepts of solidarity and social responsibility. During the 2 days of the workshop over 110 students from 4 high schools in Budapest and surrounding towns joined the workshop. In 2016 Blinken OSA developed its first Teacher Training Program for Hungarian high school history teachers. Following the CEU Senate Approval, the official accreditation process was initiated with the Hungarian Ministry of Education. The program was approved and granted accreditation for 5 years. The training program titled Scopes and Constraints in 20th Century Hungarian History uses the rich collections of the Archives and offers tools for a perspectivist and critical exploration of 20th century socio-political events which generated radically different interpretations in the historical memory of Hungarians and the various ethnic groups in the Carpathian Basin. The first course ran in the spring of 2017. Each year since 2004, Student Verzio invites high school students to watch and discuss human rights documentaries in cinemas. In 2016 documentaries explored issues about poverty and exclusion; environmental problems; refugee rights and third world exploitation. 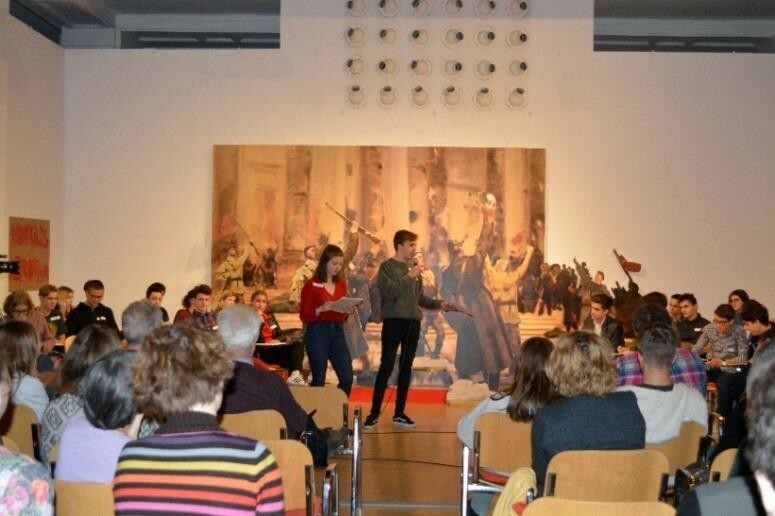 In conjunction with the exhibit Symbols of Socialist Art, Blinken OSA hosted 164 students from 8 high schools across Budapest for a critical workshop addressing the correlation of history, politics, and art. In October 2017, a series of student outreach programs organized in conjunction with the exhibit Somewhere in Europe/ Gaudiopolis attracted close to 800 students from 38 different schools and institutions across Budapest. The exhibit explored the story of Gaudiopolis (City of Joy), a children’s republic founded in 1945 in Budapest by Lutheran pastor Gábor Sztehlo. Gaudiopolis offered a place to live for hundreds of orphans and children left without homes after WW2, and it was not only a shelter but also a self-sufficient democratic community with its own constitution, laws, educational and cultural agenda, and institutional management. On 24-25 September, a two-day workshop evoked the spirit of Gaudiopolis with the participation of children from Cseppkő Children’s Home (Budapest) and Fészek Waldorf School (Solymár). With the professional guidance of the Budapest based architecture team Architecture Uncomfortable Workshop (AUW), the program invited students to experiment with form and matter, working with clay, wood, textile, and plaster using various techniques. The resulting artworks became part of the exhibit installation. 577 students joined the guided exhibition tours in October. Students came from Budapest-based high schools, a few primary schools as well as universities and art colleges. The workshops held on 17-19 October attracted 178 students from six high schools, and explored the concept of democracy and dictatorship in a role-playing game which tested the decision-making abilities of students in a community. In the spirit of critical thinking and freedom of opinion, Student Verzio invites high school students to free film screenings and discussions since 2004. In 2017 documentaries explored issues about: child laborers who want nothing more than to attend school; a refugee teen who wants a secure future for her family; a boy with the heart of a girl; the emotional life of teens with Down syndrome; the public media of community tourism; food waste in Europe; and the future of crime prevention. Tracing Revolutions / Are Revolutions a Moral Issue? 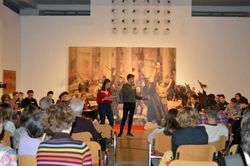 This student debate invited two student teams from two Budapest high schools to debate about the aims, results and afterlife of revolutions from a moral perspective. In 2018, we will continue our efforts to bring students and teachers to OSA/CEU to participate in creative and engaging programs. The second Teacher Training program kicked off in January, 2018 with 23 participants, and more workshops and student programs are on the way.